New Delhi: The Supreme Court on Friday ordered a ban on mining and construction activities in Kaziranga National Park and animal corridors. 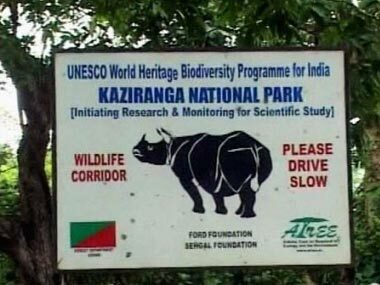 Mining activities were banned along the southern boundary of the Kaziranga National Park and Tiger Reserve, and construction was ordered to be stopped on the routes that form nine animal corridors. The bench of Justice Arun Mishra and Justice Deepak Gupta ordered the ban on the recommendations of the Central Empowered Committee (CEC) in its report. The CEC report came in the wake of alleged large-scale illegal mining and stone crushing activities within the elephant corridor connecting the Kaziranga National Park and Karbi Anglong Hills. This included the private forests falling in the Karbi Anglong Hills Council Area, and within the eco-sensitive zone. Seeking a response from the head of the Karbi Anglong Hills Council Area on the report, and on the recommendation of the CEC, the court directed the Director General of Assam police to ensure that no mining activity takes place in the catchment area of the streams/rivers originating in the Karbi Anglong Hill ranges. The court also directed the police to ensure that no transportation of illegally mined material from Karbi Anglong Hill took place.